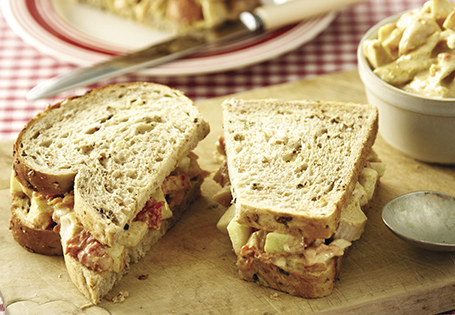 A tasty take on a chicken salad sandwich. In a medium bowl, combine chicken, vegetable oil, salt, pepper and parmesan cheese. Stir to coat. Place chicken on a parchment-lined baking sheet. Bake for 25 minutes or until internal temperature reaches 165°; allow to rest for 10 minutes. Dice chicken, reserve. Place bacon on a baking sheet and bake for 12 minutes. Allow bacon to cool; crumble and reserve. In a medium bowl, combine chicken, bacon, pasta sauce, mayonnaise and tomato. Divide chicken mixture evenly among sandwiches.